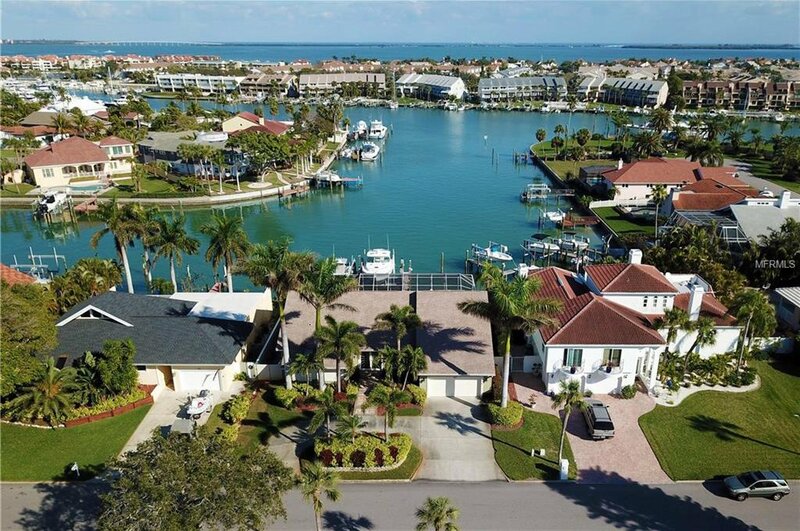 Boater's Paradise in beautiful Tierra Verde with one of the best views on the Grand Canal. This 3 bedroom, 2.5 bath home features an open floor plan, a generously sized living room, formal dining room, and bar with beverage fridge, ice maker and a kegerator. Fabulous kitchen with granite countertops, gleaming stainless appliances, breakfast bar, and ample cabinets to meet the needs of the most discerning cook. Tile and carpet flooring. Spacious bedrooms, plenty of closet space and storage, master bedroom with outdoor sitting area and spa-like master bath. The entire house is bright and airy, exuding the finest in Florida living. Manicured lawn, mature landscaping; large, private patio/deck perfect for al fresco dining and entertaining; screened in-ground pool with hot tub; dock and boat slips with both 40K and 16K lb. lifts; easy access to the Gulf with no bridges. Quality workmanship throughout; double glass door entryway; 2-car garage. This incredible home is move-in ready. The only thing it’s missing is YOU! Listing courtesy of RE/MAX METRO. Selling Office: KELLER WILLIAMS TAMPA PROP..